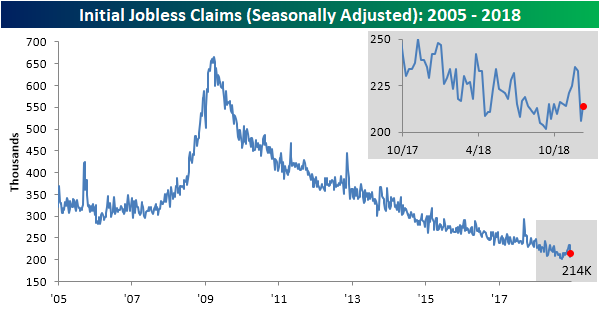 Following last week’s significant downtick to 206K initial jobless claims, this week’s reading rose to 214K. This is slightly below the 215K rise that was expected, and while this week’s release is about 12K higher than last week, it is still at the lower end of the range we have seen in the past year. It is also well below the surprisingly elevated levels that we saw only a few weeks ago in late November. As we have been highlighting, despite short-term upticks in claims, the indicator remains at very strong levels and has maintained some impressive streaks. This week marks the 63rd straight week with claims coming in at or below 250K claims. That’s the longest streak since the 89-week streak that ended in January 1970. Claims have also remained below 300K for a record 198 weeks. The 4-week moving average saw a slight decline to 222K. This is only a little over 2K lower than last week’s 224.75K but well off of the short-term high of 228K from two weeks ago. 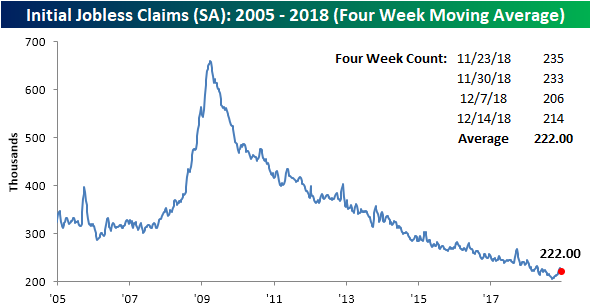 As we mentioned last week, the drop in claims was in line with seasonal patterns and likely bottomed out for the holiday season as this week’s uptick was to be expected. 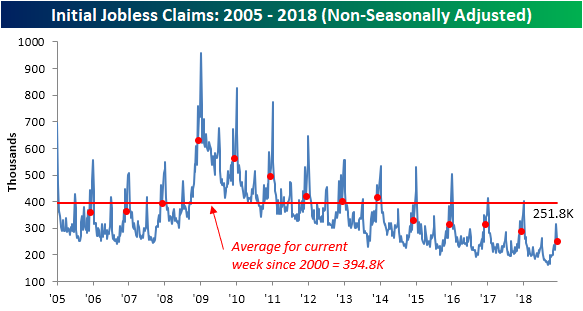 Claims still had their strongest week in the time since 2000 on a non-seasonally adjusted basis. It is also over 140K below the average for the current week since 2000. Again as we mentioned in last week’s post, everything is occurring parallel to historical patterns, and as that keeps up, there will likely be higher NSA readings in the coming releases. Regardless, claims still indicates a very healthy labor market.